Childe Hassam, America’s foremost Impressionist, was born in Dorchester, Massachusetts. He left high school to go to work in Boston, where he learned wood engraving and eventually became an illustrator. His illustrations appeared in such publications as Scribners and Harper’s. Concurrently, he studied art at the Boston Club, and then the Lowell Institute before finally establishing his own studio. His works of the early 1880s are characterized by an ongoing exploration of new media and subject matter. Hassam first visited Europe in 1883. It was, however, only during his second, more extended stay, which lasted for three years beginning in 1886, that he became acquainted with the work of the French Impressionists. A year after his arrival in Paris, his sun-flooded landscapes already exhibited broken brushwork and a new and more vivid application of color. Form, however, does not dissolve but retains its integrity. It is never totally sacrificed to color vibrations. Hassam is probably best known for his views of New York City and landscapes of summer resorts in New England. Most of the latter were painted on the Isles of Shoals. Around the middle of the nineteenth century, the Isles of Shoals, ten miles out in the Atlantic off the New Hampshire coast, became a fashionable vacation site. In a period of rapid urbanization, these islands provided an atmosphere of wild nature combined with comfortable lodgings for writers, musicians, artists, and well-off tourists. It was here that Childe Hassam engaged in summer painting campaigns for some thirty years. Summer Sunlight belongs to this group of “Shoals” works. Painted in 1892, it is an excellent example of the period during which Hassam executed his most lyrical, atmospheric works. The setting is probably Appledorf Island, where a friend, the writer Celia Thaxter, had a home. Like many of the “Shoals” paintings, it is infused with a sense of bright light and fresh air.||Hassam’s connection to his French Impressionist counterparts, and to Monet in particular, is evidenced both in this work’s execution and subject. The use of repeated dabs of a specific color tone to link figure and landscape, as well as foreground and background, is a device found often in paintings by Monet. Here it can be seen in the lavender touches in the boulders, the woman’s dress, and the distant ocean, or in the echoing oranges in the rocks, the figure’s hat, her book, and the pattern of her frock. Depictions of a person reading are also frequently found in Impressionist paintings. The theme of a self-absorbed, detached figure allowed for the kind of objective representation without drama or narrative implications that they preferred. Here, her face averted and veiled in shadows, the anonymous woman is seated reading anong the shelflike rocks that overlook the sea. 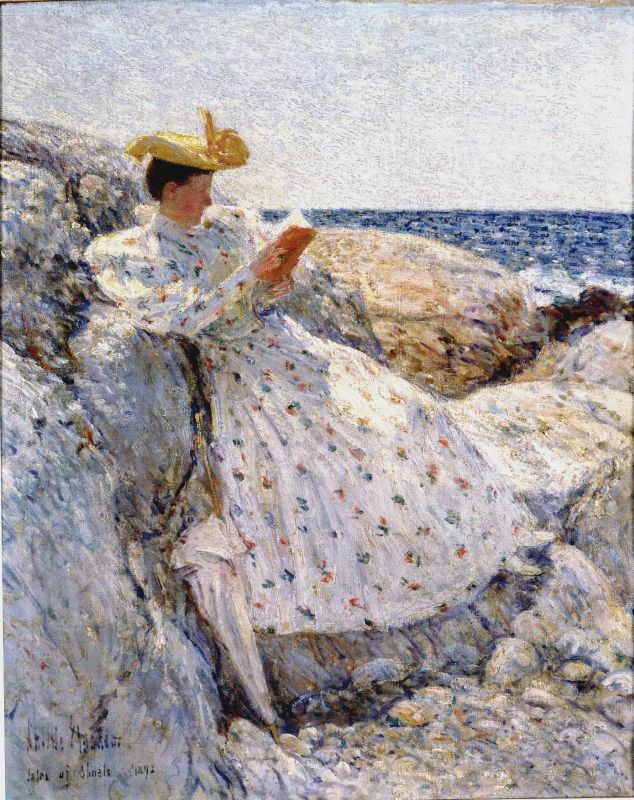 The sense of isolation and the contemplative atmosphere, so well conveyed in this work, were among the attributes of the Shoals Islands that brought Hassam back time and again to this summer retreat.